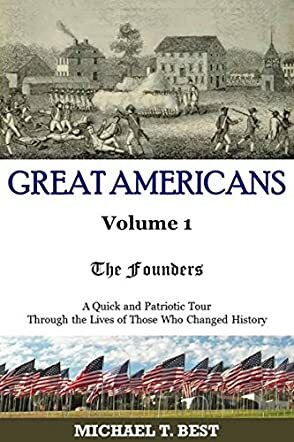 Great Americans: The Founders by Michael T. Best is the first in what is going to be a series of books about the men and women who helped found America. This volume introduces us to Benjamin Franklin, Daniel Boone, John Hancock, David Bushnell, Samuel Prescott, Isaac Davis, Abigail Adams, Henry Knox, Robert Fulton, and Dolley Madison. Each chapter provides biographical information about each historical figure, a photo/graphic, and a "Did You Know?" section that provides interesting trivia about that person. For example, did you know that Benjamin Franklin is the only American to sign the three major historical documents: The Declaration of Independence, The Treaty of Paris, and the U.S. Constitution? The well-documented bibliography at the end will allow history buffs to seek out more in-depth information if they wish to do so. Great Americans: The Founders by Michael T. Best was a fun read and taught me a lot about this great country of ours. Having tried to learn history before but finding history books boring, I loved reading Great Americans: The Founders by Michael T. Best because I learned important things in an easy and fun way, enjoying the biographies, stories, and trivia about each historical figure. I look forward to the next volumes Michael T. Best has planned, including The Inventors and The Artists. This is the best method of learning history that I've ever encountered and as an American and a voter, I should know more about this stuff.